Jode Designs: Think outside the square.. Stylish wardrobe..
A lot of older places these days don't have wardrobes in the bedroom.. Or very tiny ones! And using the portable hanging racks from the $2 shop are a little unattractive and look like they are going to collapse under weight!! So why not make one of your own and make an attractive 'out-in-the-open wardrobe' area..These ideas are also great if you are renting a house/room as you can take it with you from home to home!! Enjoy.. 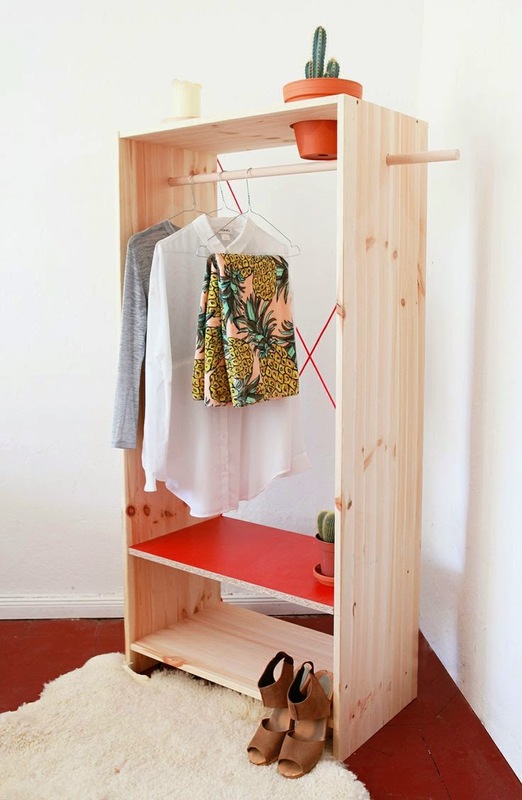 IDEA ONE: Build a plywood wardrobe with a planter.. This stylish wardrobe, made from plywood, also comes with a feature 'planter' hole at the top to had some nature into a room.. It features rod for all your hanging clothes and two shelves for your folded clothes and shoes etc.. You can leave it as is our paint it your favourite colour.. Enjoy.. IDEA TWO: Build a steel pipe and wooden wardrobe.. This wardrobe is not only functional but also creates an industrial ambiance.. It has three heights which is great for longer clothing pieces.. a platform along the bottom and three cute shelves on the side perfect for all your accessories! Put heavy duty casters to provide mobility.. Enjoy.. 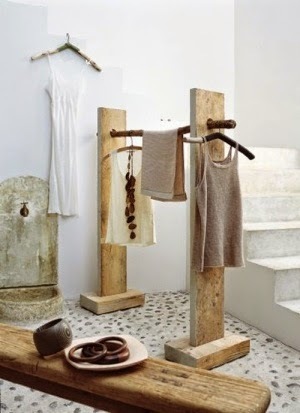 IDEA THREE: Build a wardrobe with oak sticks and leather.. This modern looking wardobe is not only easy to make but can be easy folded up and stored.. Made from just oak stock and leather ribbon.. You can leave it natural or paint it to suit your style.. The top and side sticks make a great hat and bag rack too.. Enjoy.. 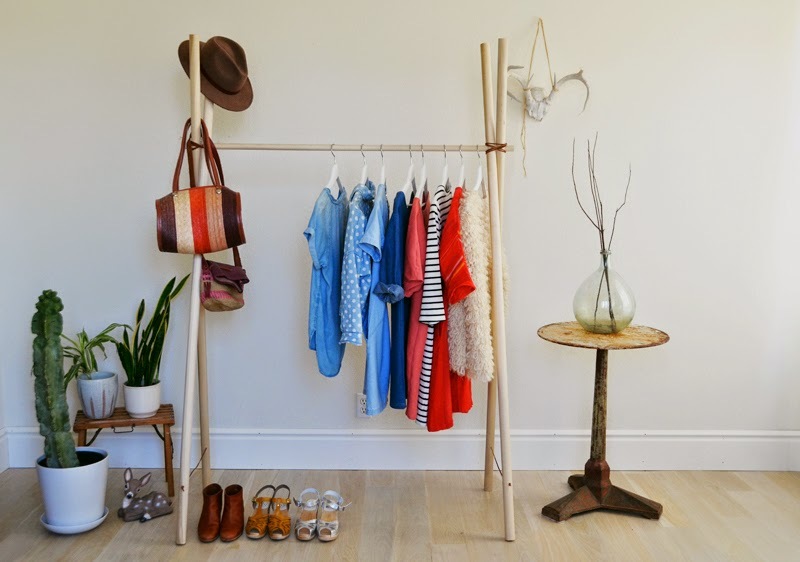 IDEA FOUR: Build a wardrobe from a wooden ladder..
As you know I love to restore old pieces of furniture, so I really wanted to share this great idea with you.. Unfortunately this is not a portable wardrobe, but if you are in a position to drill into the wall (if renting please ask your landlord first!) 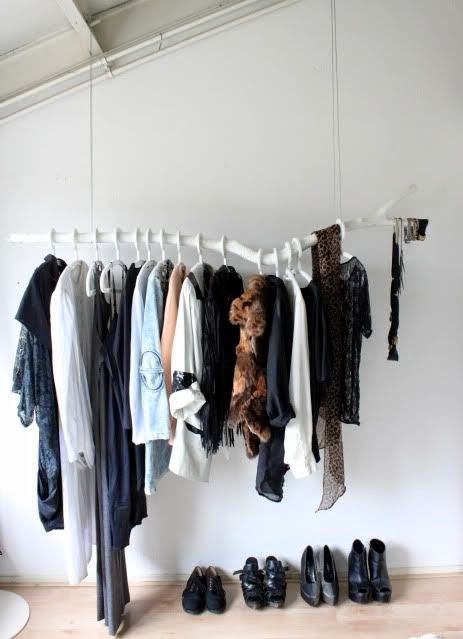 this wardrobe would look fantastic!! You can pick up old wooden ladders from many markets or second-hand shops, add a bit of paint,then hang.. The ladder rungs are great for your hanging clothes.. you can also stack boxes etc above too.. Enjoy.. IDEA FIVE: Build a wardrobe from a tree branch..
You would of seen this idea in a few shops.. but I just couldn't go past it.. Again, you will need a bedroom which you can drill into the ceilings (sorry!!) Or you could make up some metal or timber holders for the branch.. You can paint the branch or leave it as is.. Try to get one with a few smaller branches attached for your accessories.. Enjoy..